India's booming economy, the deregulation of the aviation industry, and government's goal to enhance regional connectivity has brought about a huge increase in the number of domestic airlines in India in recent years (although not all of them have survived). Passengers can now choose from three full-service airlines (one of which is government-owned), four low-cost carriers, and a number of regional airlines. All domestic Indian airlines allow check-in baggage of up to 15 kilograms free of cost, except for Air India (which allows up to 25 kilograms). The main drawback when it comes to low cost carriers is uncomfortable seats and lack of leg room. In addition, passengers must pay for food on-board. To help you make the right decision when flying, here's an overview of what you can expect from each airline. Until recently, Jet Airways was widely regarded as a reliable full-service airline. However, the airline encountered major financial problems in February 2019, resulting in the grounding of many of its aircraft and increasing cancellation of flights. This has reduced the airline's fleet of aircraft from nearly 120 down to about 40. Publicly-owned Jet Airways commenced operating in mid 1993, and was listed on the National and Bombay stock exchanges in 2005. The airline holds about 16% of the market share, making it the second largest airline in India after IndiGo. The airline's base is in Mumbai and it also has hubs in Delhi, Bangalore, Kolkata and Chennai. Jet Airways previously won many awards for quality service. In particular, the airline was known for its outstanding in-flight service, food, punctuality, and baggage handling. Unfortunately, there have been growing complaints about the airline's service over the past couple of years. JetLite used to be Air Sahara until Jet Airways successfully took the company over in mid 2007. It was later merged with JetKonnect in early 2012. It operated as the low cost arm of Jet Airways until December 2014, when the airline changed its strategy to only offer full-service flights across its network. JetLite still exists as a subsidiary entity, although a merger is approved, but operates as a full-service airline that's integrated with Jet Airways. Air India is India's government-owned, full-service airline. It was founded in 1932 by J. R. D. Tata (considered to be the father of aviation in India) and called Tata Airlines, before becoming Air India in 1946. Indian Airlines (the domestic carrier) merged with it in 2007. The airline is based in Delhi and has a secondary hub in Mumbai. Its fleet of 109 Boeing and Airbus aircraft flies to 84 destinations -- 48 of these are domestic and 36 international. Its market share has dropped significantly, to around 13%, in recent years. In June 2017, the Indian government announced plans to privatize Air India. The main issues are punctuality and air safety. On-time performance is poor, and the airline has been involved in as many as 12 fatal accidents in its history. On the positive side, it has well planned routes and flight schedules, flies to most destinations in India, is surprisingly reliable when it comes to baggage handling, has comfortable seats and plenty of legroom, and serves tasty meals on-board. Note that the airline has been experiencing substantial financial troubles for a number of years, and flight delays and cancellations are common. The airline's passenger load factor of about 77% is among the lowest in India. India's new full-service domestic airline, Vistara, commenced operations in January 2015. The airline is based in Delhi, and is a joint venture between Singapore Airlines and Tata Sons. It has grown to operate across 21 destinations in India, with a fleet of 11 Airbus A320-200 aircraft, and has a 3.6% market share. Being India's most luxurious domestic airline, ticket prices are set a little higher than Jet Airways. There are economy, premium economy, and business class seats. On-time performance is excellent. Award-winning IndiGo Airlines is based in Delhi and flies to 48 destinations -- 41 in India and seven international. This low-cost airline started operating in mid 2006 as a private company and was listed on the National Stock Exchange in November 2015. It has the largest market share in India of 40%, and is also the largest low-cost carrier in Asia. IndiGo's continually growing fleet comprises 114 Airbus A320-200 and A320neo aircraft. Despite keeping fares low, the airline hasn't compromised on punctuality, connectivity of flights, safety, or customer service. 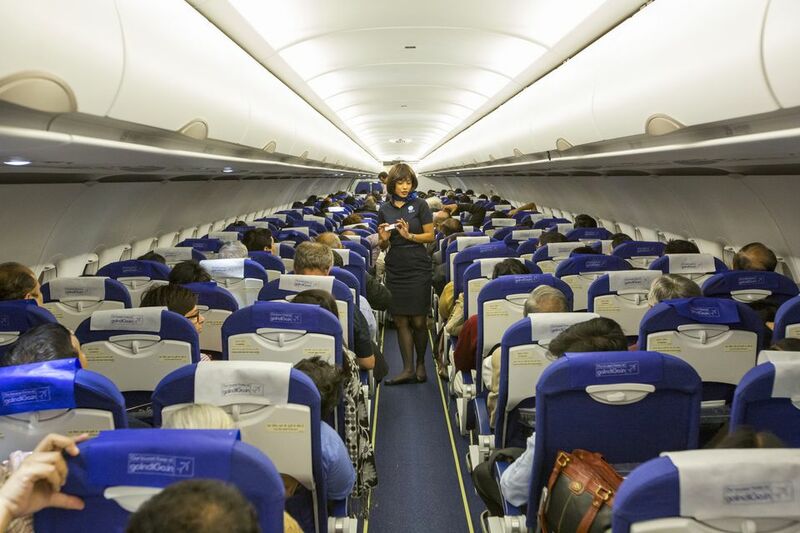 If you're looking to fly with a low cost airline, IndiGo offers excellent value for money. It's considered to be India's best low-cost carrier and it also has the best on-time performance in India. SpiceJet is India's second largest low-cost carrier. This airline, which is listed on the Bombay Stock Exchange, started operating in mid 2005 and grew steadily. It captured around 18% of the market before running into severe financial problems in 2014. As a result, the airline was forced to cancel a number of flights and its market share dropped to 12%. It received new finance in early 2015 and a new logo in mid 2015. The airline recovered astoundingly well under new management, quickly becoming profitable. Discounted promotional fares are often offered and SpiceJet has a passenger load factor of over 90%, which is the highest in India. On-time performance has also improved significantly and is among the best in India. Market share increased to just over 13% in October 2017. As well as low-cost fares, the airline offers premium services such as extra leg room and priority baggage handling under the name SpiceMax. SpiceJet is based in Delhi and has hubs in Mumbai, Hyderabad and Kolkata (which have been added as part of the airline's regional expansion plans). It flies to 45 domestic and seven international destinations, with a fleet of Boeing and Bombardier Dash aircraft. Go Air is a small privately-owned, low-cost carrier that started operating in late 2005. The Mumbai-based airline has grown slowly and has a 9.5% market share. It operates a fleet of 21 Airbus A320 airplanes to 23 destinations in India. Its remote destinations include Leh, Srinagar, and Guwahati. Go Air offers some of the cheapest domestic fares available in India. Punctuality has been a common complaint about this airline in the past. However, it has improved. AirAsia India entered the Indian market in June 2014 as the first foreign airline to set up a subsidiary in India. This low-cost carrier is a joint venture between AirAsia and Tata Sons. It's based in Bangalore and also has a hub in Delhi for its north Indian operations. The airline started its domestic operations with a Bangalore-Goa flight. It now has a market share of about 4% and flies to 17 destinations across India, with plans to expand further. Unfortunately, this doesn't include Mumbai. The fleet consists of eight Airbus A320-200 aircraft. Trujet is a new regional south Indian airline. Based in Hyderabad, it started operations in July 2015 to connect Tier I cities with Tier II and III cities. What sets it apart is that it targets pilgrims, and hence its 10 destinations include places such as Aurangabad (the airline provides passengers with a free bus from the airport to Shirdi) and Tirupati. It also promotes connectivity by offering a 500 rupee voucher to passengers who fly any airline and Trujet on the same day. Privately-owned Trujet is backed by number of investors and promoted by Telugu actor Ram Charan. It has a fleet of three ATR 72-500 aircraft and a market share of 0.5%. There is scope to improve reliability as the flight cancellation rate is about 13%. Air Costa is a low-cost regional airline that's based in Vijayawada, in Andhra Pradesh in south India. It began operating in 2013 and focuses on connectivity between Tier II and III cities in India. Currently, it flies to eight destinations in India (Vijayawada, Tirupati, Vizag, Ahmedabad, Bangalore, Jaipur, Chennai and Hyderabad) and has a market share of 0.7%. Its other hub, where its fleet of three Embraer aircraft is maintained, is in Chennai. These smaller planes have a 2x2 seat configuration, with no middle seat. While the performance of Air Costa was generally good at the start, apart from flight cancellations being an issue, it has deteriorated. Flight operations were suspended for a day in August 2016 due to a problem with the airline's aircraft lessors. This created passenger uncertainty and grievances, and brought the airline's expansion plans into doubt. The airline again announced a suspension of operations in late February 2017, due to financial issues. Air Carnival is regional south Indian airline that started off as a charter airline in 2013 and transitioned to scheduled operations in July 2016. It's based in Coimbatore in Tamil Nadu and has a hub in Chennai. The airline focuses on poorly-served destinations in south India. It currently flies between Chennai, Coimbatore and Madurai using a single ATR 72-500 aircraft. Unfortunately, reliability is an issue. The airline had the highest cancellation rate in India of 20% in August 2016. It also had the highest rate of passenger complaints. Note that Air Carnival was suspended from operating in mid June, 2017. Kingfisher Airlines has the same "King of Good Times" owner as India's Kingfisher beer. It started operating in mid 2005 and built up a 15% market share. However, severe financial troubles in 2012 caused its market share to plummet to the lowest in India and its flight schedule to become unreliable. The airline (including Kingfisher Red) was subsequently suspended from operating and has shut down. Kingfisher Red, originally called Air Deccan, was a privately-owned low-cost airline based in Bangalore. It started operating in mid 2003 and was India's first low cost carrier. Kingfisher Airlines took over the airline in early 2008. Air Deccan, India's first low-cost airline, is relaunching operations on December 22, 2017. It will be participating in the Indian government's UDAN scheme, to boost connectivity to regional airports. The airline will have four bases, in Mumbai, Delhi, Kolkata and Shillong. Its destinations include emerging towns in Assam, Delhi, Himachal Pradesh, Punjab, Jharkhand, Maharashtra, Meghalaya, Mizoram, Tripura, Uttar Pradesh, Uttarakhand and West Bengal. The first flight will be from Mumbai to Nashik. Flights are operated using an 18-seater Beechcraft 1900D aircraft.